Drawing on location, William Crook Jr. is a familiar sight along Springfield, Illinois streets and county roads. His landscapes and city scenes show his love of neighborhood and bio-region. For over thirty-five years Crook has chronicled the changing life and times of his mid-western home town. Bill received his bachelors in arts from Sangamon State University in 1982, and in 1990, his master’s degree in painting at Illinois State University, Normal. From 1990 to 2001, Crook served as an adjunct art instructor with MacMurray College, teaching at the Jacksonville Correctional Center. He also taught in adjunct positions at Benedictine University in Springfield, Lincoln College in Lincoln, Illinois, and Lincoln Land Community College campuses in Jacksonville, Taylorville, and Beardstown, Illinois. Crook’s style of drawing is self-taught although it was greatly influenced by R. Crumb. He has done illustrations in conjunction with the works of such comics luminaries as Harvey Pekar and Tucker Petertill. Currently Crook is a contributor to Mineshaft, a comics and literary magazine from Durham, North Carolina. Crook founded Prairie Press in 1990. He produces fine art prints and note cards. His printing method uses relief photoengraving plates which are made from his pen and ink originals. Over the years Crook’s work has attracted a local following. In 1982, he self-published a hand printed book containing forty-four street scenes. In 2001, his painting Cliffs in the Shawnee National Forest was purchased for the collection of the Tarbell Library at Eastern Illinois University. In December 2014 he was named Illinois Artist of the Month by I Like Illinois an Illinois State website. Bill is a member of The Pharmacy Gallery and Art Space where he shows his work in Springfield, Illinois (www.pharmacygallery.com ). 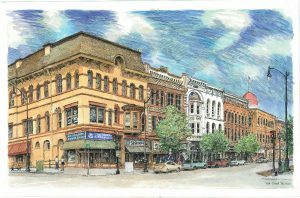 In 2017 Crook published a retrospective collection of his forty years drawing on the streets of Springfield titled “Springfield Illinois: A Pen and Ink Artist looks at His Hometown. Bill can be reached by phone at 217-726-2072, or by email at bill.h.crook@gmail.com. His street address is 1821 Cherry Rd., Springfield, IL 62704. You can also find him at his website: www.williamcrookjr.com. Come into relationship with art. Receive it, and experience it with your senses. Do not grab ahold of it with your eyes and break it down with critique and analysis as if it were a product or a thing. Meet and embrace it as a living being. I remember when I was about five years old sitting in our living room with my mother and a small group of her friends. They had gathered to share and “piece” together their lives around a quilting frame. I recognized some of the re-purposed fabrics as dresses both my mother and I had worn. They had been re-cut and re-combined to form a beautiful new pattern. My mother and her friends had an intuitive and intrinsic understanding that their shared stitches and their shared lives wove a blanket of connection. Their quilting was inherently feminist in nature. My art reflects that early experience of re-purposing and re-combining fabrics. I primarily work with fabrics that I re-purpose. There’s something about the whole process of finding interesting designs in fabrics at thrift shops that is pleasing to me. I enjoy the tactile experience of working with fabric, of cutting out patterns and then collaging, sewing and embellishing them. 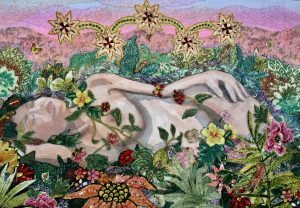 I primarily work with themes of feminism, spirituality, and our relationship with nature. My creative expression has been enhanced and informed by my spiritual development. As my mind has slowed and quieted through the years of my spiritual practice, I have experienced a downloading of creative inspiration. I attempt to express through my art the sacred Presence that I experience on the inner. The creative process for me is a dialogue between me, the art, and Source. I want my pieces to communicate the fragrance of this “Presence”. Then it may be possible for the viewer to follow this fragrance back to his or her Higher Sacred Self. While some of my work is figurative, incorporating primarily female figures and landscapes, I am also attracted to creating geometric mandalas. Mandalas are cross-cultural symbolic representations of the universe which represent wholeness and connection to the Infinite. I begin at the center which represents our connection to the Higher Sacred Self, and then allow the design to naturally flower.